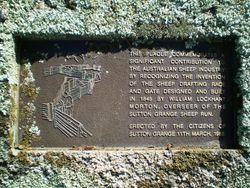 A plaque commemorates the contribution to the sheep industry by the invention of the sheep drafting race and gate by William Lockhart Morton in 1848. 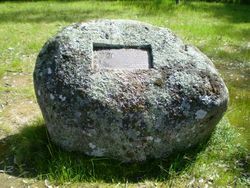 William Lockhart Morton (1820-98) was a resident in the pastoral districts of Victoria from 1842. This well-informed, resourceful man interested, himself in a wide range of topics. Among other things, he invented a swing gate for drafting sheep, investigated the pastoral potential of the land between the Lachlan and Darling Rivers, and advocated the introduction of useful animals and agricultural seeds to Victoria. In June and July 1861 he made an extensive tour of the Wimmera and Mallee region, basing himself at Pine Plains Homestead, and making trips as far afield as Horsham and Lake Hindmarsh in the south and the Pink Lakes in the north. His account of these travels, published in the Yeoman and Australian Acclimatiser under the title 'Notes on the tour of the Wimmera district', gives a vivid account of his proceedings: the nesting habits of Mallee Fowl, collecting dew for drinking water in the desert, and potential agricultural use of gypsum, and particularly the vegetation he saw. He gave to Mueller the specimens collected on these travels, as well as his later excursions through New South Wales and Queensland.